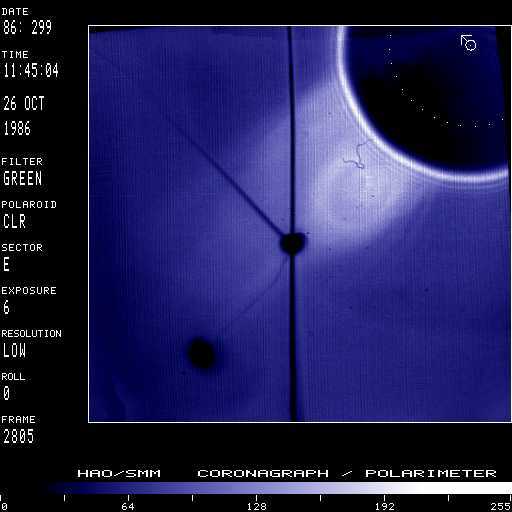 A slow moving loop/cavity and core were ejected over the southeast limb of the sun on October 26, 1986. Solar north is toward the upper left as indicated by the arrow drawn into the occulting disk; the dotted circle marks the solar photosphere. Cavity with evolving core rises slowly in southern part of the streamer. Loop becomes visible around cavity. Loop becomes 'light-bulb' shaped. Part of streamer is blown out. Deflections.